Purple Essence Marbleized Embroidery Scissors  - $9.56 : Yarn Tree, Your wholesale source for cross stitch supplies. Item 2839. Purple Essence Marbleized Scissors. 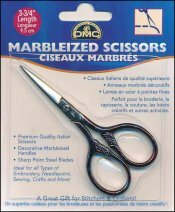 Pretty marbleized purple handles on premium quality, 3¾” embroidery scissors. Stainless steel blades and unique decorative handles. Perfect for embroidery, creative stitchery, needlepoint, crewel, sewing and crafts.